The head of European football wants to change the transfer system to stop big clubs "hoarding" the best players. 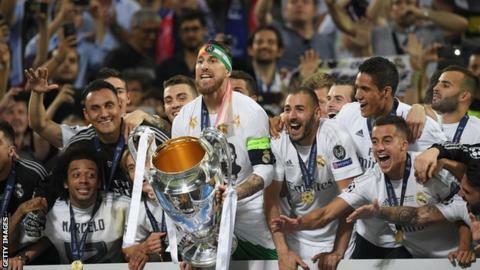 Aleksander Ceferin, president of European football's governing body Uefa, says a "luxury tax" on rich clubs and squad limits could also help to stop elite clubs dominating the game. He said the "excessive concentration of talent with a few teams" had to change. "Uefa has a duty to protect the whole of football and not just the elite," Ceferin told a conference in Lisbon. The Slovenian lawyer, who was elected to the role last September, told a conference in Lisbon that Uefa needed to address a "decrease in competitive balance" within European club football. "We need to assess whether the transfer market is the best we can do," he said. "We cannot be afraid to touch it. We do have to examine new mechanisms like luxury taxes and in particular sporting criteria like squad limitations and fair transfer rules, to avoid player hoarding." He did not give any further details on what he meant by luxury taxes or fair transfer rules, but added that Uefa could work with global governing body Fifa to make changes to the transfer market - or do so via its own licensing regulations. Some of Europe's smaller leagues have complained about big teams signing up their best players at a young age, only to immediately send them on loan elsewhere. In the Premier League, Chelsea had more than 30 players out on loan earlier this season, while in Italy champions Juventus have more than 50 players loaned out. Ceferin also said Uefa would set up a new division entitled "Protection of the Game" to tackle doping, corruption, violence and match-fixing.